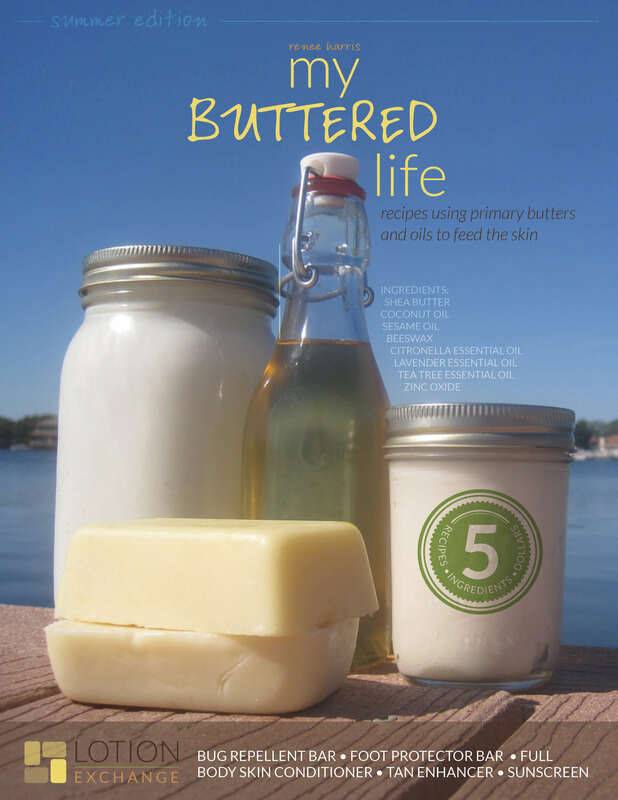 You are here: Home » Blog » Homemaking » My Buttered Life Ebook: 5 Summer Skin Recipes and a Giveaway! By reading the ingredient list on most skincare products, you would think that it’s necessary to have a degree in chemistry and your own in-home lab if you ever wanted to create your own. Sunscreen in particular seems daunting to me and I wouldn’t have the faintest idea where to begin if I wanted to make one of my own. That’s why Renee Harris’ (of MadeOn hard lotion bars) new ebook, My Buttered Life, somewhat flabbergasted but mostly just delighted me. I’ve already tried making hard lotion bars myself, as well as lip balms. I couldn’t believe how simple it was to make really fantastic lotion and even my 6 year old still talks about how easy and fun it was. With only 3 ingredients, how could it be anything but simple? But surely, products like sunscreen, soothing after-sun lotions, bug repellant and tan enhancers must be more complicated, right? Except that they’re not. When I took my first read through My Buttered Life, I couldn’t believe that everything could be made with just 5 ingredients or less. Even better for the most frugal among us, most of the recipes use overlapping ingredients, so there is definitely an increased cost-effectiveness with the ingredients you do buy. At the end, Renee breaks down the costs of the ingredients and shares her favorite places for buying them. 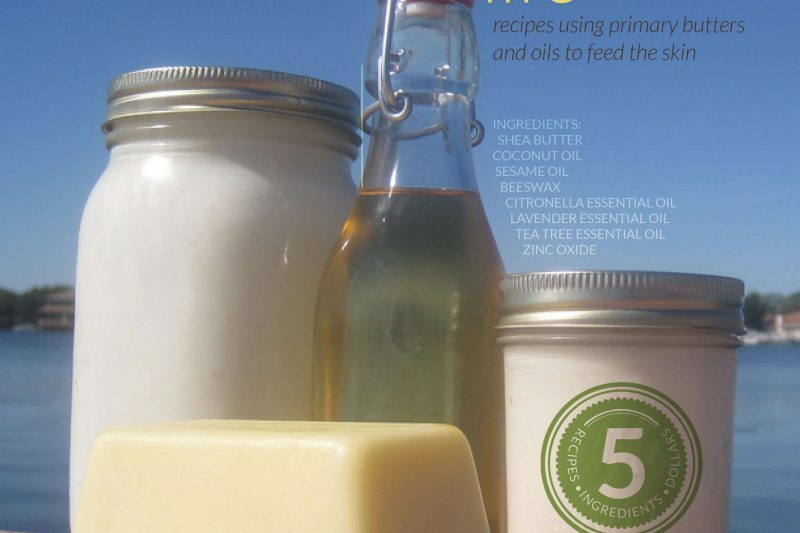 If you’d rather not source most of it out yourself, you can purchase DIY kits from her website, which come with the three basic oils- beeswax, coconut oil and shea butter. You can also opt to add in zinc oxide if you plan on making sunscreen. The only other potential ingredients you would need are a few essential oils (only small amounts are used, so these go very far) and one recipe includes sesame oil. Seeing as most natural sunscreens and other summer skin products are extremely expensive (not to mention the fact that you still need to wade through ingredient lists, safe product comparisons, etc. ), I love the idea of simply making my own and knowing exactly what is going on our family’s skin. Do I have you itching to try making your own yet? Well, I have an excellent giveaway for you today! A grand prize of one DIY Lotion Kit plus My Buttered Life ebook, and another 5 copies of the My Buttered Life ebook! 1. Tell me which summer skin recipe you most want to make from My Buttered Life. 3. Share about this giveaway through your blog or favorite social media (you can follow Keeper of the Home on Facebook or Twitter). 4. Grab an extra entry by signing up for MadeOn’s email newsletter list. Giveaway has now ended. Thanks, everyone! Disclosure: This post includes affiliate links, as I am a proud affiliate of MadeOn Skin Care Products. When you purchase through one of my links (which you are absolutely not obligated to do), you help to support this site, so thank you! I only promote products that I believe in myself, and I don’t know where my dry hands would be without these amazing hard lotion bars. I would love to try the whipped lotion. It sounds great. I love this product, I’ve used it with great results! I do not know if it is just my computer but on your video the music is louder than your speaking. Have a great day! I would love to make the lotion!! Living in the sun of AZ I would love to try the sunscreen recipe. Thank you for this great review. I would love to try the foot cream. What a great giveaway; thank you, Stephanie! I want to make the bug repellant bar!! I am a Keeper of the Home subscriber. I am a MadeOn subscriber. I definitely want to make the lotion bar! I have sensitivities to any type of lotion that can be bought off a shelf. I love using coconut oil, but it can be a bit greasy. I like the idea of the beeswax forming a barrier to keep the lotion on the skin. subscribed by email to Keeper of the Home! This is right up my alley! I’d like to make the tan enhancer. I would love to try the sunscreen recipe! Sunscreens are so expensive to buy and hard to find natural ones! I have a sunburn right now… how can I make my own suntan lotion? I’d love to know! I want to make them all but I think first would have to be the bug repellant and the sun screen. This is awesome! I just signed up for the MadeOn newsletter! I put an order in last week and can’t wait to try her products! First thing I’d make is the bug repellent bar. Would be wonderful to have something natural and safe to use on my family. Great giveaway! I’m an email subscriber to Keeper of the Home. I would like to make the bug repellant bar. I already subscribe to this blog. Already am an RSS subscriber! Shared on FB Fan Page!!! I would love to try the foot protector and the bug repellent bars. I subscribed by email to Keeper of the Home and would love to try all of them for I hate what they put in the ones you buy at the store. Love this giveaway! I would love to make the full body conditioner. I am a subscriber to the MadeOn newsletter. I would love to make the bug repellant bar – I am a mosquito magnet! I use sunscreen so often, I’d love to make the sunscreen! The bug repellent bar is definitely something I’d like to make! I’d be interested in learning how to make a sunscreen for my family. Great website! I just subscribed via rss, and would love to learn how to make sunscreen. I subscribe to KOTH by e-mail! I would like to make the full body conditioner. I would love to make bug repellent! I would love to make the sunscreen recipe! Florida girl here. I am a subscriber and really enjoy getting your newsletter. I also get you on Facebook adn ‘like’ your posts. I signed up for made on email. Would love to make sunscreen for my family! would love to make the sunscreen and whipped lotion! I just subscribed to MadeOn’s newsletter and am looking forward to receiving it. Thanks, Judi. I would love to make sunscreen I thought was safe. I would love to make my own safe suncreen! I would first make the bug bar! I would LOVE to learn how to make our own sunscreen! We just moved into a house with a pool in the backyard and we are burning through sunscreen like crazy. 🙂 Thanks for a great giveaway! I subscribed to the MadeOn newsletter. I’m already subscribed to KoTH email. I am most interested in the body conditioner recipe. I love her lotion bars but sometimes I want something more liquidy. I subscribe to MadeOn’s newsletter. I would love to have the bug repellant recipe and the Sunscreen one. I would love to try all of them, but the foot protection bar and bug spray appeal to me most. I want to make all of them, but the sunscreen would be my first to try! I subscribe to Keeper of the Home by email! I would LOVE to make the sunscreen. This is our first summer not using commercial sunscreen, we have been wearing hats and shirts more, using coconut oil and avoiding the sun in the hottest parts of the day, but I would absolutely love to have a recipe for good protection if we are out for a long time. First I’d make the sunscreen, then I’d make the bug repellant bar! I’d like to try the sunscreen recipe. they all sound great but I think my cracked heels need the foot protector bar! I also signed up for MadeOn’s newsletter. Oh, I can’t wait to make the whipped lotion! The full body conditioner sounds delightful! the bug repellent bar would be great to make! I’d like to make the Bug Repellant Bar! I subscribe via RSS fee. I would love to try the foot protector bar! I signed up for MadeOn’s email newsletter list. I subscribe to Keeper of the Home via email and would love to make the body conditioner. Bug bar recipe would be awesome! My kids are all apparently delicious – I’d love to make the Bug Repellent Bar. I would love the sunscreen! I want to try the tan enhancer! I am a Keeper of the Home subscriber and I would love to make a natural bug repellant bar!!! Id be really interested in trying to make the sunscreen! I would like to make the sunscreen. Thank you for the opportunity! I would love to try to make sunscreen. I just signed on for the newsletter. I would love to try the Full Body Conditioner. I would love to try the bug bar. I would love to make sunscreen. I signed up for Made Ons email. Gosh I want to make them all! But bug repellent, sunscreen, and lotion would be nice. We just tackled soap! I would love to try the sunscreen recipe since we go through so much of that in the summer! Thanks! I’d first want to try the bug repellent recipe. I subscribe to Keeper of the Home by RSS feed. I’d love to learn how to make the sunscreen and the whipped body lotion! Hard decision! I have never found a sunscreen I can use because they all make me burn worse! I am curious about whether this natural sunscreen would work for me & would love to give it a shot! I would definately make the Full Body Conditioner. I would love to try the foot bar!!! I would love to make the Full Body Conditioner. I am subscribed to Keeper of the Home by email. I shared about this giveaway via Facebook. And I subscribed to the MadeOn’s email newsletter. Thanks! I would love to learn to make the full body conditioner! And just blogged about it. I would like to try the bug repellent bar for my younger siblings. I am subscribed to Keeper of the Home via email. I signed up for MadeOn’s email newsletter. Bug Bar – but I’m interested in ALL of it!! Signed up for her email list! Subscribed to the MadeOn newsletter. Would love the bug bar recipe! I want to make the sunscreen– okay I want to make them all because I make the lip balm with much success so I know I will love it!! I would definatly love to try the foot protector and bug repellant. Wow…the video was such a tease…lol I’m really interested in the bug repellent and the tan enhancer. Thanks for the giveaway and for sharing a great ebook. I am also a subscriber and use google reader to capture all your posts and found you via Compassion. I need the sunscreen! Bad!!! I would love to learn to make my own sunscreen!!!! Bug repellant! The Mosquitos are eating us up! I would love to make my own lotion bars! I’d really like to try making sunscreen. I would really like to make the sunscreen and the bug repellant. Two things we buy and I know I could make them! Thanks for the fun giveaway. I would love to have the book in my resources. I would be interested in learning to make sunscreen. Full body conditioner! I made the hard bars and bug repellent with the DIY kit but would love to try the whipped stuff! I have also subscribed to the MadeOn Newsletter! I am a subscriber to Keeper of the Home email. I’d like to try making the sunscreen! …and I just signed up for the Made-On newsletter. I am really looking forward to that, until today I didn’t realize they had one! I’d like to make the bug block bar! I would love the recipe for the sun screen. Bug repellent bar – bugs love my daughter and I hate using Off or something like that on her! I would be most interested in the Full Body Conditioner. Thanks. I have signed up for MadeOn’s email newsletter. I am most interested in the bug repellent bar. I attract bugs like no one else!! I’m a subscriber and I would love to make the foot protector bar… my feet are soo cracked from wearing sandals all summer. Foot protector and the Fully Body Conditioner sound great! Want to try both! I’d love to try the bug bar! I love their bug block, but I would love to try the foot bar! I like the idea of making my own lotion. I will smell (or not smell) exactly the way that I want and I’ll know what’s in it! I signed up for Made On’s newsletter. I’ve signed up by email. I’ve signed up for MadeOn’s email newsletter. I signed up for made on’s newsletter! I want to make ALL of it, but especially the sunscreen and bug repellant. I want to make the full body conditioner! We live in a very dry climate. I already subscribe to Keeper of the Home – and love it! I would like the bug repellent. I’ve thought about making some of my own products, but it seemed impossible to find a good, easy way. Thanks for the info. Signed up for the email list too! I would love the recipes for the sunscreen and bug repellent- if I had to choose just one I’d most want the sunscreen, I think. I would love to try the sunscreen. I am also already an e-mail subscriber. I just liked your facebook page and shared it on my wall. I would love to try making sunscreen! It would definitely be a toss up between the “foot protector” and the “tan enhancer”. I really want to make my own sunscreen too! I’d love to learn how to make natural sunscreen. We just spent four weeks in the southwestern US and I cringed every time I sprayed my kids! I’d be most interested in the bug repellant bar! I would love to learn to make the tan enhancer. I signed up for made on’s email list! I want to make it all, but the first one I’ll try is the foot bar! I have VERY dry feet – they split and HURT! I have “liked” you on Facebook, but I like you in real life, too! ha! I’m already a subscriber of Keeper of the Home – I really enjoy the encouragement to live healthy and natural! I would definitely like to find out more about the foot protector bar and the whole body conditioner! I’ve been looking for a recipe for soap and now found one for Goat Milk Soap……my favorite! I would like to make the bug repellant bar and the sunscreen. I’ve really been interested lately in natural sunscreen! I’d love to have the bug repellent recipe. This e-book looks like a winner. I would love to try the sunscreen recipe. I’ve been looking for a good recipe for a while. Foot protector bar. Already receive yours and Renee’s newsletters. Thanks for the give away. I would LOVE to use the sunscreen recipe!! I shared on facebook. Love your blog. Keep up the great work! I would make the bug repellent. love to try the foot protection bar! Sunscreen!!! I have yet to see a recipe for that and it’s something we need in Georgia! I would make the sunscreen. We don’t have bug issues (not the kind a repellant can deal with) in the desert, unless it repels black widows and scorpions, and with our sun’s intensity, you tan right through sunblock anyway. 🙂 I was wondering where you go the lip balm recipe. Do I have to pick only one? How ’bout lip balm, lotion and sunscreen? I also subscribed to MadeOn’s emails. I wasn’t going to, but after spending some time there…WOW! Thanks for sharing them with us. I’m going to try this with my children. I want to make the bug repellent. I think I would be most interested in the bug repellent bar. I subscribe to the Keeper of the Home email updates. Bug repellant! I bought a natural one and it didn’t work AT ALL. I subscribed to MadeOn’s newsletter list. I would like to try the sunscreen recipe. Shared about this giveaway on FB! Thank you for hosting this giveaway! I would def like to make the bug repellent bar…our backyard is swarming with biting insects! The bug repellant bar would be great. Am already signed up for your emails so I trust that counts towards the give away. Thank you for the possibilities. I would love to try the recipe for sunscreen. My children and I have fair skin, so we use a lot of it–making our own would be wonderful! Bug repellant…. the bugs are bugging me! Thanks for the giveaway! I married into an Irish family. My little girls are so very white I need sun repellent!!! I would love to try the sun screen recipe. I would love to try the sunscreen recipe for my babies!!! I would like to make the sunscreen. I would love to try the sunscreen one! I want to make the bug bar… I am getting eaten alive out here! I would like to try the tan enhancer. I would most love to try the sunscreen! I want to try the bug repellant. I’d like to try the bug repellant! I’m signed up for MadeOn’s newletter. I signed up for the MadeOn newsletter. Thanks for the extra entry! I am subscribed to your rss feed! Avid reader! I’m most interested in the homemade sunscreen recipe. I’m subscribed via RSS and email! In NC the UV index is through the roof! So I would love to make the sunscreen recipe! Thanks! I just signed up for madeon’s list. I would like the bug repellent recipe. I already subscribe to Keeper of the Home on email. I already subscribe to the Made On site. I really want to try the lotion bars! I would love to try the full body conditioner! I subscribe via email to Keeper of the Home. I subscribe to the Made On Newsletter. I definitely want to try sunscreen! I think the sunscreen would be the most helpful. I would love to make the bug repellant bar! I’ve tried to make different “bug sprays” and so far, none of them have worked. I subscribed to Made-On’s newsletter! I’d really like to try the bug repellent. I would really love to make my own sunscreen! I think I would start by making the bug repellent bar to use when I work at our local CSA o in our own little garden. I really want to make the bug repellant. I haven’t found any “safe” ones to use on my daughter yet, so this would be a great thing to make! I already subscribe through my Google RSS Reader. I already subscribe through email too. I would love to make the sunscreen! And, I just signed up for MadeOn’s email newsletter! 🙂 Thanks for the post, Stephanie! I would love to try the foot balm. My feet get so dry in the summer. I love going barefoot as I water my garden but it reeks havoc on my feet…especially my heels! I subscribed to MadeOn’s email newsletter too! i’d make the bug repellent for my hubby. I want to try the full body conditioner. My skin is so dry. But I love chapstick too! I just found your blog and boy am I thankful! My family is on the road to more natural (and frugal!) living. All of your ideas are such a blessing! I would love to try the Full Body Conditioner for my daughter, she has terrible eczema and is very sensitive to chemicals. I just subscribed to MadeOn’s email newsletter. I’m going to have to try their lotion bar for my daughter’s sensitive skin. I’d love to use their kit to make my own! I’d love to make my own sunscreen! I’m already a subscriber through email. I would love to make the foot protector…the flip flops do a number on my feet! I shared the link on Twitter! (You don’t appear to have a tweet button linked but I copy and pasted). ALL the recipes sound wonderful – but for the sake of my chewed-on children, I’d have to make the Bug Repellant Bar first! I would love to try the bug repellent bar! I would like to try the bug repellant. I would love to try my hand at making sunscreen. I subscribe with an RSS reader. I would love to make safe sunscreen for my kids. I’d like to try making the tan enhancer! I subscribe to MadeOn’s email newsletter. I have to make the bug repellent bar. My 5 year old grandson is a mosquito magnet and I will not use anything toxic on him. My back yard is filled with citronella filled tiki torches, but fire creates another problem around active boys. I need HELP!! I would love to make all of these, but I’m particularly interested in the full body conditioner! My skin has been so dry this summer, and I HATE slathering on all those chemicals from commercial lotion. I would love to make the sunscreen – its so hard to find a good one for those of us who are predisposed to skin cancer. I subscribe to MadeOn’s email list. I am subscribed to Keeper Of The Home through RSS feed! The bug repellant would be the first I would try. Thanks for the giveaway! This is so timely! Well, maybe a little late. 😉 We just spent the weekend at the river and my poor husband came home with a terrible sunburn on his back. Even though I put sunscreen on him! So I’d love to learn to make my own sunscreen. I’ve always thought that was impossible or something. Thanks! And I shared the giveaway on FB! I would love to try to make sunscreen. I subscribe to your email and subscribed to MadeOn and I shared this via FB. Thanks!!! I would definitely want to try the sunscreen. Lots of fair skin around here. I subscribe to Keeper of the Home through Google. I signed up for MadeOn’s newsletter. What a great book! I’d love to try the sunscreen recipe. I subscribed to MadeOn’s newsletter. I’d like to make the bug repellent bar the most. I’d love to know how to make the suncreen! With two light skinned kiddo’s (and a mama) I need an alternative product! I follow you through my google reader. Does that count? I am most eager to make the sunscreen. I gotta say, though – I’m a little concerned about the notion of “enhancing” a tan or building a healthy one. There is absolutely no such thing as a “healthy” tan. Any change in skin color is a sign of skin damage! I also subscribe to MadeOn! Lotion…. I really need some right now and this would be perfect! Definitely the sunscreen. I bought the best I could find and it was way expensive. I already subscribe to Made On’s newsletter. I would want to make the sunscreen. I seem to be allergic to something in most sunscreens, so I would like to try something more basic and see how it works! My son has horrible psoriasis and I have some wicked cracked feet (groos ~ tmi). I’d DEFINITELY be interested in the hard lotion bar ad I think it would help us lizards incredibly well!!!! Please put my name in the hat? I’d love to try the bug repellant bar. I am already subscribed. Thanks!!! i want to try the sunscreen! I have very dry skin in the winter and some exczema on my hands. I would love to try an all natural moisturizer that would take care of both issues. I’d like to learn how to make the bug repellent bar! I subscribe via RSS to KotH. I am a subscriber via email…what a great give away! Thanks! I would love to learn how to make the sunscreen and the foot protector for my husband and myself! I just subscribed to MadeOn’s newsletter. I want to try the sunblock! Curious to know if it really works. I subscribed to the MadeOn newsletter list. I most wish to make the sunscreen. I want to try the sunscreen first, then the bug repellant and then the all over body lotion for mommy. Would love to learn how to make sunscreen- living in the hot desert I am always slathering some kind of “sunblock” on my kids. I would love the foot one… my feet are definatly in need of some TLC since I love running barefoot in the summer, and that makes for some rought feet!!! I would love to make the bug repellant bar! I need to learn how to make the foot protector bar. I would LOVE to make the sunscreen recipe for my family. We have strived for the last several years to find a healthier alternative to store bought sunscreens, since my husband has battled melanoma and it is genetic! I am trying to find something without the chemicals that I can put on my children! This could be exactly what my family (of almost 5) needs!! I am really interested in the bug bar. I’d love to try the sunscreen recipe! I subscribe via RSS feed. Thanks for an awesome giveaway! I’m interested in it all, but especially in making my own bug repellant. I subscribed to MadeOn’s email list. I am always looking for a good lip balm, and my gardner’s hands could use a healing lotion as well. I am a subscriber – and I love your updates! Congratulations on your baby #4! YAY!!! The bug repellent bar sounds interesting. Autumn is on it’s way and the bugs come with it! We use Skin So Soft from Avon now but we don’t like the oily feel afterwards. Congratulations!!!! And I already subscribe to your email……and RSS feed! I want to try the sunscreen. Thanks for the giveaway! And I just subscribed to made on’s list! I would love to try to sunscreen. I shared this giveaway on my facebook page. Love your blog and Congrats on the baby! I would love the foot protector bar recipe! My partner wheres boots all day long and his feet have always been embarrassing for him. I’d love to help him in a way that doesn’t need an aerosol can. What a great book! I would kill for a solid sunscreen recipe that is cheap and won’t hurt my eyes! I would definitely like to try the sunscreen. I use sunscreen everyday as I’m blessed with very fair Norwegian skin that burns super quickly. It’s expensive and the chemicals that are entering my body concern me. I would love that foot care lotion right now! I’m dealing with dry, uncomfortable feet and I’m looking for some way to take care of the issue. I really want to try the sunscreen!!!! I’ve been researching non toxic and gluten free sunscreens lately. I would love to be able to make my own!!!! I would love to try the sunscreen… I had no idea you could make that yourself! I subscribed to Made On’s newsletter. I want to make the sunscreen! I subscribed to Made On Hard Lotion via email. I definitely need the body skin conditioner–even in the summer, my skin gets dry. I want to learn how to make the sunscreen! I live in the Middle East and we have a problem in the winter with mosquitos indoors. I would love to make the Bug Repellant Bar as these pesky insects keep us awake, buzzing all night long! I am a subscriber to Keeper of the Home and I LOVE it! Um, yes, all of them, please! The recipes all sound great! I would love the recipe for the foot protector bar! The recipe I would like is the body skin conditioner. I am a subscriber and would love to make the sunscreen. I have had melonoma and I hate how heavy (and expensive) regular sunscreen feels so I hide a lot when I would rather be outside. I would love to make the full body conditioner! I would love to make all of her products but the one most important would be the sunscreen! The sunscreen! I can’t find a sunscreen with ingredients that I agree with! Thanks for the great giveaway! If I had the recipe book would make the Full Body Conditioner for me and the Foot Protector Bar for my husband. I subscribed to MadeOn’s newsletter! I would love to see the full body conditioner. I subscribed to Made On. I would love to make the body condition. I am always desperate for a good moisturizer. Or maybe the bug repellent because I was eaten alive on my hike last week. signed up for MadeOn’s email newsletter list. Sunscreen and the foot protector lotion sounds great! I am so curious about the sunscreen! Even if I dont win, I will definitely buy the book!! Aaaaannnd, just signed up for the newsletter.